Six remarkable urban landscape projects demonstrate the versatility, durability and permanence of concrete. Concrete – with its ability to be coloured, textured and moulded into an endless variety of features – offers a superb canvas for the building of durable, functional and attractive urban landscapes. 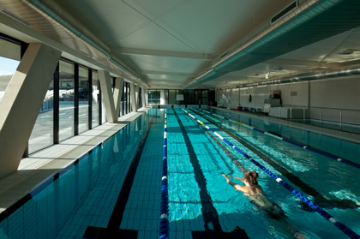 This highly versatile construction material delivers the resilience and durability required for projects in the harsh Australian environment. When coupled with good design and construction practice, concrete can be used to create beautiful urban landscapes that are built to last. 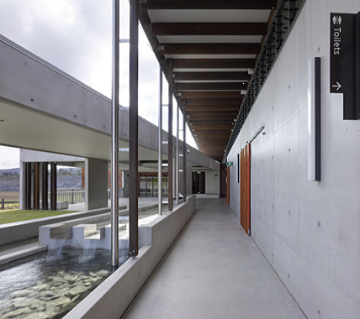 The following projects exemplify the beauty, adaptability and functionality of concrete. 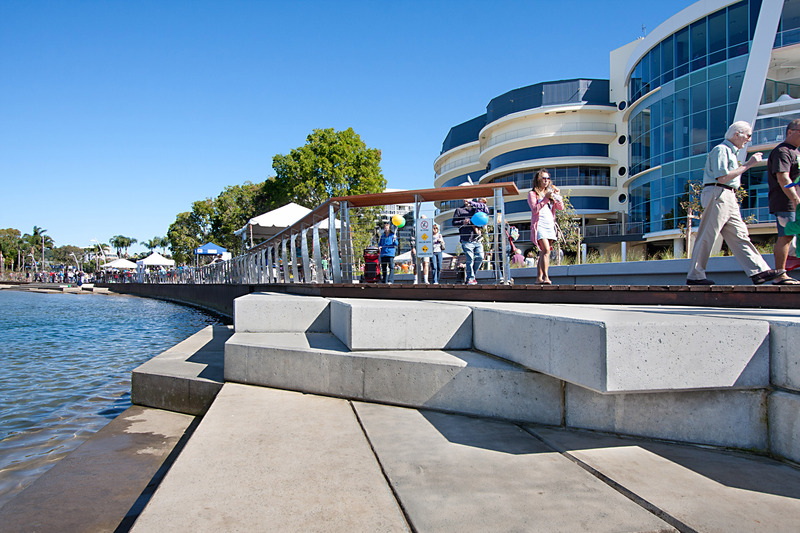 Concrete was chosen to enrich the existing shoreline park and create a unique new civil space for the upgrade of Jack Evans Boat Harbour – Stage One by Aspect Studios. 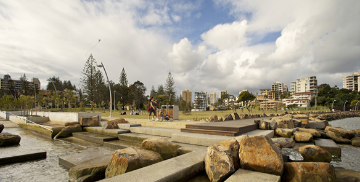 The “spine” of this reinvented public space in Tweed Heads, New South Wales is a recreational and aquatic promenade that incorporates thoughtfully designed and defined elements to provide access to the water’s edge. These elements are made predominately from concrete. They include in-situ water platforms with varying degrees of exposed aggregate to create a non-slip surface; tessellated precast platforms that create a distinctive visual matrix; and a headland feature that combines natural rocks with in-situ concrete platforms to create tidal pools. The main paths are also made from in-situ concrete, with a heavily exposed aggregate finish and warm pigment colouring, which both complement the coastal setting. The waterfront has been designed with concrete to cater for the site’s changing environmental conditions, frequent tidal variations and intermittent storm surges. 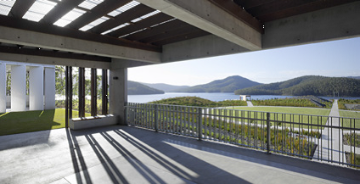 Concrete has been used at Hinze Dam Visitor Centre and Parkland to underpin this vantage point and recreation space for visitors. As well as serving functional and social purposes, the concrete design also reinterprets the powerful engineering concept of the dam wall and its rock form. The project, designed by Malcolm Middleton Architects with AECOM, with landscape architecture by Andrew Neighbour and John Donoghue, is located in Advancetown, Queensland. It features off-form Class 2 concrete above ground for the walls, columns and beams of the visitor centre. The concrete was batched on site and placed by the same workers involved in the construction of the dam wall. Finishes are minimal and robust, right down to the raw, fibrous treatments inside the amenity areas and the lightly honed surfaces of the pathways. The natural tones of the materials sourced on site are expressed in the finished project – an ochre colour references the clay lining of the dam itself, and is applied as an accent to the necessarily over-scaled concrete. 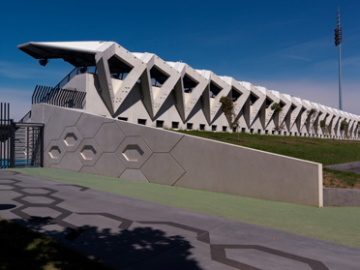 Extensive use of white structural concrete was incorporated into the refurbishment of Lakeside Stadium, a major Australian sporting facility in Melbourne, to create a striking visual identity. White concrete was used to create the wall cladding for the Ball Bounce Courts, as well as the structure, seating platforms, roof support and walling of the new North Stand. H2o Architects devised a highly articulated wall element, employing concrete as a structural, form-making and textured material to define the contemporary development of this historic sporting ground. The finish of the concrete walling is largely influenced by the pattern of soccer goal netting, while the expressive diamond shapes and “V” supports in the North Stand are a subtle reference to the motif of the South Melbourne football club, which once called the ground home. Concrete was also chosen for its durability, self-finished properties, cost-effectiveness and the fact that it’s easy to maintain. 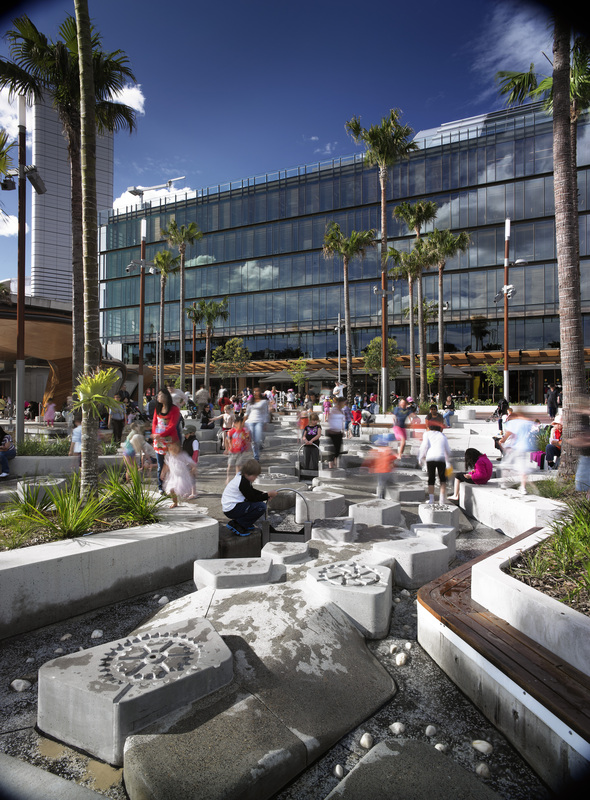 Concrete was used extensively in the award-winning Darling Quarter urban park and play space by Aspect Studios in Sydney. The combination of water erosion and heavy traffic from the hordes of excited children who play in the water playground make for a demanding environment. Concrete was able to deliver the project the permanence and durability it needed to withstand the pressures of daily use. Concrete also allowed the design’s incredibly complex forms to be realised without compromise. As a result, this project has successfully revitalised a post-industrial area of inner Sydney, offering an iconic landscape that showcases the wonder of water. 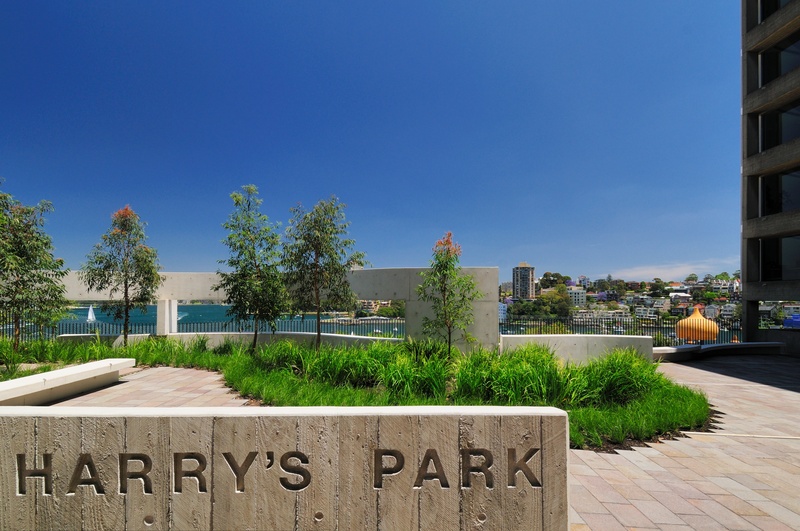 Harry’s Park, designed by Harry Seidler and Associates, is a public bequest from Penelope Seidler in memory of her late husband, the renowned architect Harry Seidler. The park design celebrates an eclectic palette of materials, forms, textures and contrasts, and features elegantly curving off-form concrete walls placed in dialogue with white off-form concrete benches. Concrete’s ability to be poured into essentially any shape or form allowed it to be used to articulate a story in the landscape. Words were cast to communicate and commemorate the life and work of Harry Seidler, leaving a legacy for generations to come. Concrete was also used to create custom urban furniture and other landscape features that bend, twist and curve to form the shape and layout of the public domain. At Adelaide Airport, designed by Taylor Cullity Lethlean, concrete has been used artfully as the foundation for the sophisticated spatial and material planning of this important public space. Concrete was used extensively within the airport carpark, plaza and porte-cochere, the last featuring an in situ coloured concrete road suitable for heavy traffic. 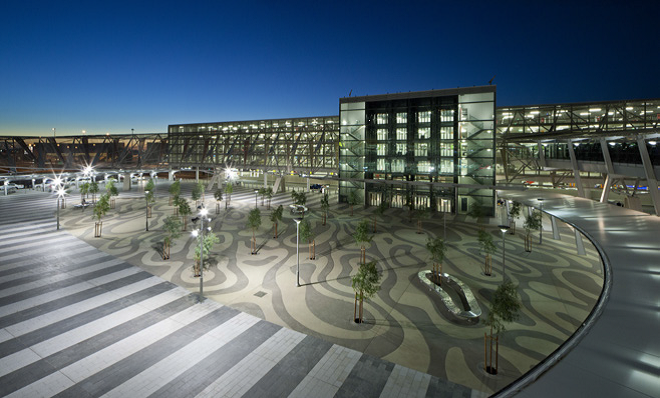 Through colour, variety and contrast, concrete creates interesting patterns in the pavement surface, producing a landscape vista that warmly welcomes visitors to the airport vicinity. 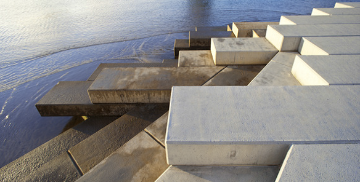 In our urban landscape, concrete enables the landscape architect to create shape, texture and form. 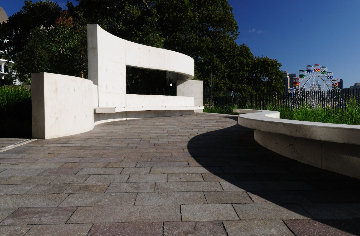 These six significant Australian landscape projects have used concrete in a versatile and creative manner, demonstrating the permanence and durability of a material that is truly the foundation of our urban landscape.